Ali Bey Hotel is situated about 11 km from the city center, under the influence of typical Mediterranean environment. The climate of this place remains pleasant and quiet throughout the year. And this whole setup makes it a very special place to have a holiday. Ali Bey Hotel is an endeavor of Polatkan Tourism, which is a leading player on the island. Ali Bey Hotel offers you with a numerous options of cozy bungalows and rooms dispersed around a huge swimming pool. This place promises its guests to provide a distinctive and a better holiday than any other Cypriot hotels. You will love the hospitality and generosity of the hotel staff. Ali Bey Hotel always lives up to their promise of providing a splendid and quality vacation time that you would cherish for a long time. It is run by an orthodox Cypriot family which diffuses the Mediterranean architectural style and authentic cuisine. 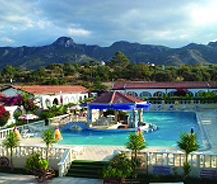 This place will provide you with amazing and scintillating sights of the Mediterranean beauty. It has always been one of the favorite tourist destinations because of its attractive and worthy holiday packages. Your stay at Ali Bey Hotel will never disappoint you as you will be extended with best and most beneficial value for your money.